When you think of Dallas do you think of Penguins? I do. From the 2012 Travel Series: What do you think of when you think of Dallas? This year the Family Travel Conference was in Dallas Texas and it completely shattered my cliche thoughts about the big city known as the Big D.
There is a billboard along the highway in Texas that reads “The sun is riz – The sun is set – and I ain't out of Texas yet”. Growing up in Seattle, my idea of beauty was formed by visions of the Olympic mountain range on one side of the sound and the Cascade mountains to the east. Mount Rainier on clear day seemed to float in the sky. I truly believed that if anyone ever visited Seattle they would absolutely want to move there. This notion was shattered when I moved to St. Louis and met a woman originally from Dallas Texas. I told her I was from Seattle and she said that she had some friends from Seattle as well. She had invited her Seattle friends to her ranch just outside of Dallas one time and they were sitting there on her porch watching the sunset over the vast expanse and she made the comment to them “Have you ever seen anything so beautiful in your entire life?” They just giggled. My notion of what the city of Dallas and the state of Texas is all about was formulated on the TV show Dallas and a cross country driving trip in 1981 when I saw that billboard about the size of Texas. When I found out the Family Travel Conference was scheduled to be held at the Omni Hotel in Dallas my expectations were that I would spend most of my time in the hotel and get a lot of work done. I knew the Omni Hotel chain is known for its excellence and for being completely accommodating to the business traveler but I had very low expectations for getting out and about in the city. To me Dallas was just another big city just like any other. It was a very long travel day getting to the Omni and so it was a delight to enter the beautiful lobby and be met by people that seemed to care more about me than about looking like a super cool hotel employee at a snobby hotel. The next two days in Dallas were a complete surprise to me as we spent time after our Family Travel Conference sessions getting a chance to visit and learn a little bit more about our host city. One of the great things about the Omni is that it is perfectly located near the DART transit line. We hopped on the DART one evening and took a quick trip to the Dallas Zoo where we spent the evening learning more about Instagram and enjoying an amazing dinner alongside the elephants. The desert that evening was one that was Monkey approved with yogurt and fresh berries. Back at the conference we were greeted by a few of the Knights from Medieval Times and learned a few more reasons for making Dallas a family vacation destination. The penguins from the zoo visited us at the hotel the next day too. On one of the tours of the hotel a couple of our friends came across Larry Hagman and were able to get a quick picture with him. It was a magical moment as the photographer caught a wonderful moment with my friend and Mr. Hagman sharing a laugh. He would pass away two weeks later but in that moment there was a magical connection. Before the Family Travel Conference my notion of Dallas was that of J.R. Ewing, and that it was a nice place for a connecting flight. But now I know that there is a a lot more to this big city in the Lone Star state. The family attractions, the historic sites, and the friendly people make it a city that is perfect for a family vacation destination. 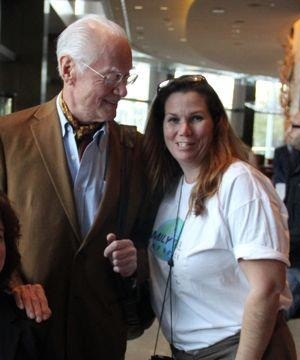 Now when I think of Dallas I will remember Larry Hagman and will always think of penguins.